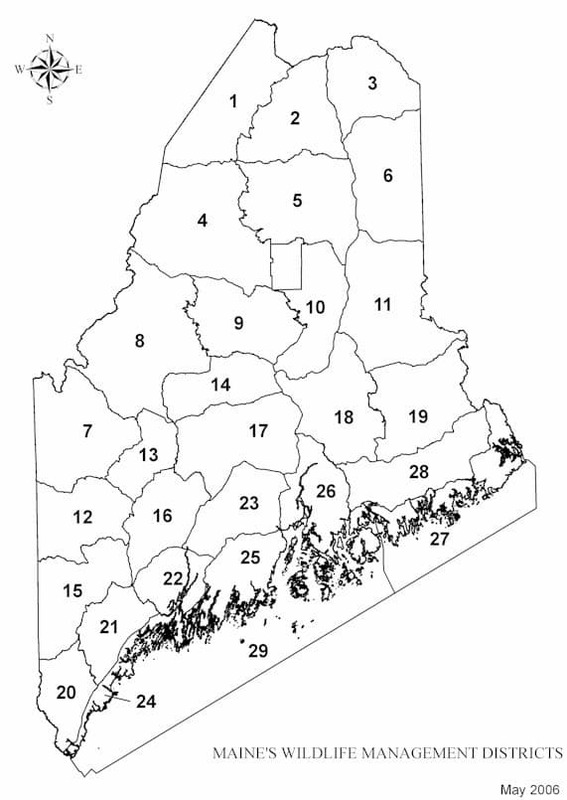 Ninety percent of all permits in Maine's 21 eligible Wildlife Management Districts (WMDs) are allocated to residents, no more than 8% to non-residents, and no more than 2% to hunting lodges. The deadline to apply is 11:59 p.m. on May 15, 2019. Which districts you'd be willing to accept a permit in, and if you'd accept a permit in another district if your name is drawn and all of your top choices are filled. See permit allocations for more information. This is someone authorized to participate with you in your moose hunt. You can designate an alternate sub-permittee, and can apply with MDIFW to change either of these names up to 30 days before the hunting season begins. Note for applicants Age 65+: A recent law change guarantees a moose permit to any Maine resident applicant who is 65 years of age or older or will turn 65 during the calendar year of the hunt, who also has at least 30 points in the lottery system. Be sure to submit your application prior to the deadline and indicate all the seasons and WMDs where you are interested in getting a permit. Upon submitting your form, you'll receive a confirmation number. Hunting License Required - Applicants must be eligible to obtain a Maine big game hunting license, either currently or by the opening day of the moose hunting season. Minimum Age is 10 - A person under 10 years of age on the opening day of the moose season is eligible to apply for a moose hunting permit and may accrue bonus points, but is neither eligible to receive a moose hunting permit, nor to be a sub-permittee or alternate. Hunter Safety - All applicants 16 years of age and older must comply with Maine's hunter safety law before a hunting license can be issued. See current safety courses. Three-year waiting period – After winning a Maine moose hunting permit, you must wait three years to become eligible to win another one (so if you received a permit in 2016, 2017, or 2018, you are not eligible for 2019); however, you can still apply and earn a bonus point. This waiting period affects permit holders only; it does not affect sub-permittees, nor does it prohibit a hunter from being a sub-permittee during their three-year waiting period. Choose districts with higher moose populations, and therefore, higher permit allocations (see chart below). 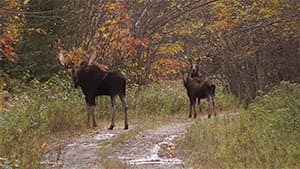 Moose permit allocations are from 2018 and are listed as reference only. Permit allocations will be updated for 2019 once confirmed. *11/2 hunt is for Maine residents only. ** Hunters drawn for WMD 27 or 28 may hunt in either district. Why we separate antlerless and bull permits and seasons: Antlerless moose (aka cows) have more bearing on population; so MDIFW issues antlerless-only permits with population growth, decline, or stabilization in mind. WMDs that can only sustain limited cow mortality are allocated fewer antlerless permits, while those with population sizes and structures that can support higher cow harvest while still meeting management objectives are allocated more. Southern Maine exception - The Southern Maine moose hunt is a slight variation on this because of the area's low overall moose density. In this case, all permits are for any moose; and per landowners' recommendations, the season now runs concurrently with the November firearm deer season to increase hunters' chances of success. When more than one chance is purchased it will increase your point for the current season only. Additional points that are purchased do not roll over from year to year. Bonus points are tracked by MDIFW using your name and date of birth. To receive bonus points, be sure to enter your correct name and date of birth on your application. You also need to indicate that you applied for the lottery last year. The online application will search our database for your record, and will display the number of bonus points you have. Enter the incorrect name or date of birth on your application or fail to indicate that you applied for a permit last year. Moose lottery winners will be drawn on June 8, 2019 at Cabelas in Scaroborough, ME. The results of the 2019 lottery drawing will be available online by 6pm on June 8, 2019. The drawings for resident and non-resident permits will be held separately. As applicants' names are drawn, they are assigned to their highest choice of available WMDs until all permits are awarded. If your name is drawn and all of your preferred WMDs are filled, you'll be assigned to a district as geographically close as possible to your first choice (unless you've indicated you are not interested in any other areas). For districts with a September and October season, permittees will be assigned to the September season until all September permits are filled, then subsequently to the October season, unless the permittee has indicated they only want the other month. Based on preference and availability, you'll also be issued either a bull-only or antlerless-only permit, unless your permit is for the November month season, which allows for the taking of either a bull or cow. Each successful applicant will be notified by mail and email within a few weeks of the drawing, so make sure you provide a mailing and email address where you can be reached during that time. The list of winners' names is also available online. Unsuccessful applicants will not be notified. Successful applicants are required to pay for their permit within a designated period. Applicants can pay for their permit and update their information online quickly and easily. Actual permits are mailed out roughly two weeks before the applicable season begins. Each year, MDIFW auctions 10 moose hunting permits to the highest bidders through a written bid process. Proceeds from these permit sales fund youth conservation education programs in Maine, and also pay for the cost of administering the auction. You may apply in both the lottery and the auction, but can only win one permit. If an auction winner also wins a permit in the public chance drawing, that person is no longer eligible in the auction and their bidding fee and bid amount will be refunded. The 2019 auction deadline is February 14, 2019. The Commissioner may decline to issue any permit or any number of permits if, in the Commissioner's opinion, the auction bids received do not reflect the public value anticipated to meet the goals of this program. An applicant must submit the permit bid form (PDF) along with a nonrefundable $25.00 bidding fee and mail it to MDIFW, 284 State Street, Augusta, ME 04333. You'll be sending us an envelope inside an envelope. Your Bid Envelope will contain your completed bid form (PDF). Bids are opened and and winners are contacted after the bid deadline. Non-winning bidders are not contacted. Within 30 days of being notified that you are winning bidder, you must pay the bid amount and select a hunting district, hunting week, and permit type. Auction winners can choose from any available season or permit type. No later than 30 days before your hunt, you may add or change a sub-permittee or alternate sub-permittee. No later than 5 days before your hunt, you may designate your alternate to take the place of your sub-permittee. Once the drawing is complete, fees are paid, and sub-permittee is selected, winning moose auction bidders are treated like all other moose permit holders. Who can shoot the moose - Only a holder of a valid moose hunting permit and his/her sub-permittee may hunt, shoot, or kill a moose. The sub-permittee can't hunt unless the permit holder is present. How to change your sub-permittee - The permittee may authorize their alternate sub-permittee to participate in place of the sub-permittee, but must notify MDIFW in writing no later than five (5) business days before their hunt begins. Restrictions for other hunting companions - Other individuals may accompany the moose hunters, but only the permit holder or licensed sub-permittee may hunt or kill the moose. Not for resale - A person may not sell a sub-permittee or alternate sub-permittee designation. This is a Class E crime. Swapping permits is allowed. See instructions below. The moose permit holder must take the steps to identify and contact potential permit holders to swap with (resources below). Law allows a moose permit holder to transfer a hunting zone, area or season and compensation between the two parties who are transferring moose permits is allowed but law prohibits anyone from facilitating, between those two parties, for financial consideration (“facilitate for consideration” means: directly receive compensation or something of value solely as part of an exchange of moose permits). Both permittees must sign a written swap letter or complete the moose swap application (PDF). The letter must include both of your names, permit numbers, permit types, seasons, and WMDs. You'll also need to attach a check for $7 made out to "Treasurer, State of Maine" (one swap fee covers both of you). Please do not send cash. The letter or application and $7 check must be sent to: Moose Permit Swap, MDIFW, 284 State Street, 41SHS, Augusta ME 04333 and received by July 19, 2019. Swaps will not be allowed after this deadline. The Department of Inland Fisheries and Wildlife has allocated 25 moose hunting permits to disabled veterans for a Controlled Moose Hunt in Aroostook County. Most of these permits will go to Maine residents with valid disabled veteran hunting licenses, drawn at random through a chance lottery. Some may be issued to sponsored Maine Veterans and will not be drawn at lottery, and others may be issued to nonresident disabled veterans who possess a valid big game hunting license and are sponsored by a National Veterans Organization. This is a one-time hunt. If you have ever tagged a moose in this hunt, you are ineligible to participate again. Permits will be issued in cooperation with the Department of Defense, Veterans, and Emergency Management. The Maine Bureau of Veterans' Services and its partners will provide logistical support to the selected disabled veterans during their moose hunt.